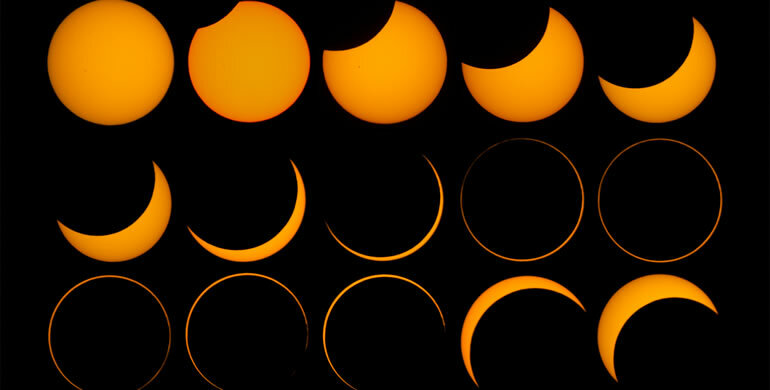 Montage of images from the the Williams College expedition to the Easter Island eclipse in 2010. 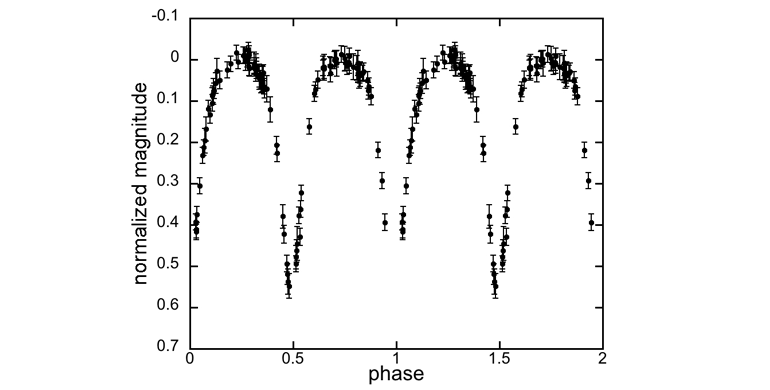 Light curve observed by Steve Souza and his students showing the brightness variation of a pair of orbiting stars that regularly block each other’s light. 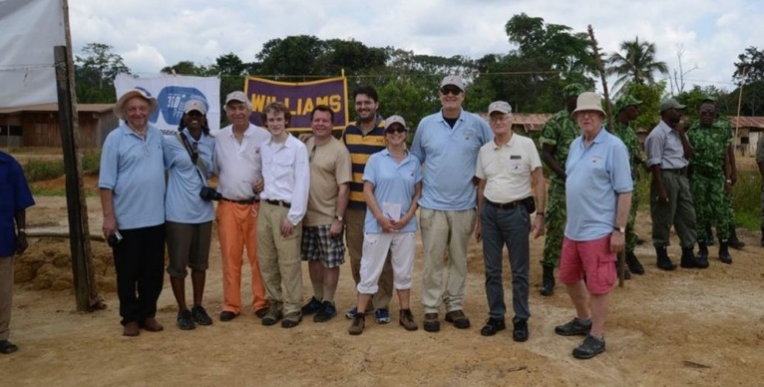 Jay Pasachoff with students, alumni and others at the Williams College eclipse expedition in Gabon, November 2013. Matt Hosek ’12 (now at U. Hawai’i), working with Karen Kwitter, explains observing remotely with the 3.5-m ARC telescope in New Mexico. Sarah Stevenson '17 and Michael May '17 working on emission-line stars with Steve Souza. Tina Seeger '16 with the POETS occultation/eclipse/transit camera system on the 24-inch telescope in our rooftop observatory, working with Jay Pasachoff. Astronomy at Williams College spans the very old and the very new. The Hopkins Observatory is the oldest existing astronomical observatory in the United States and houses the earliest Alvan Clark telescope. 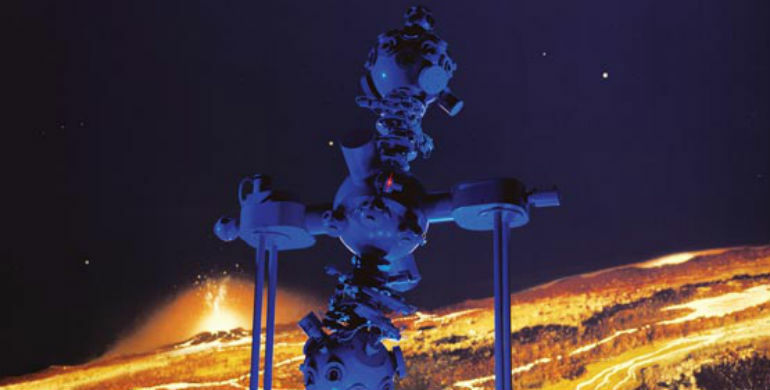 At the same time, current astronomy faculty and students carry out research with some of the world’s most advanced telescopes. The Department offers courses for both majors and non-majors. 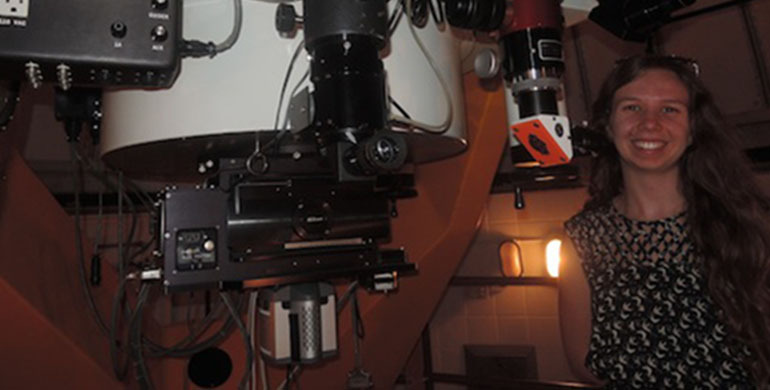 Most astronomy courses take advantage of on-campus observing facilities that include a 24-inch computer-controlled telescope with CCD detectors for imaging and spectroscopy, along with our computer network for image processing. 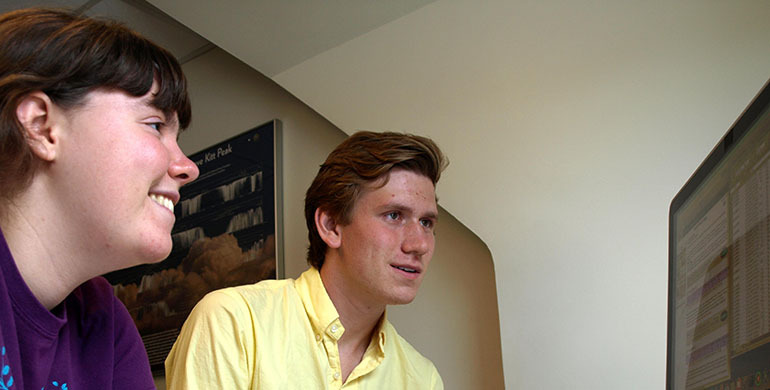 Students interested in majoring may choose either to be an Astrophysics major, administered jointly with the Physics Department, or an Astronomy major. The Department’s learning objectives and student achievement goals are stated here. 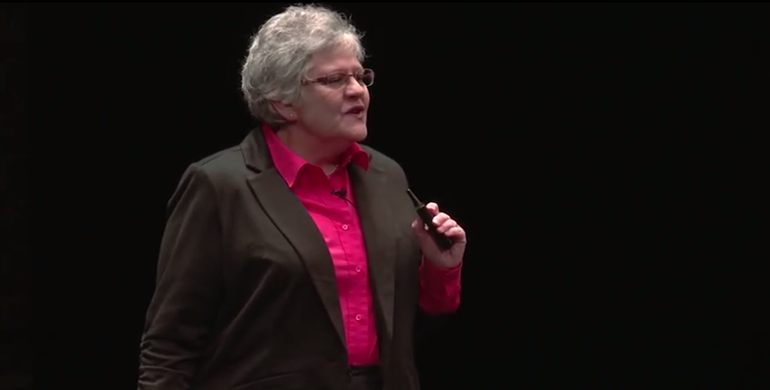 Our students participate broadly in faculty research. 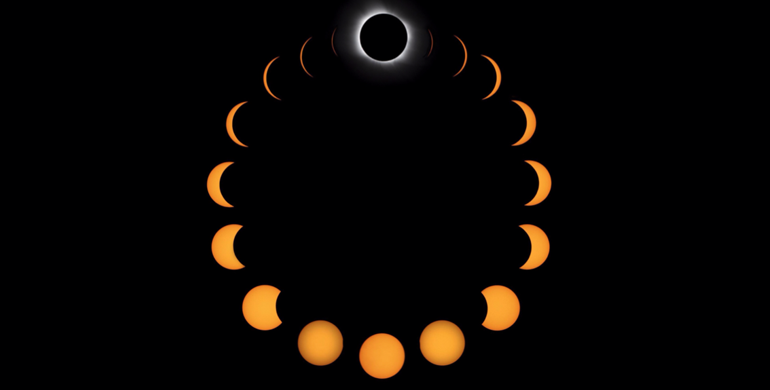 In addition, Williams College is a member of the Keck Northeast Astronomy Consortium, comprised of astronomy faculty and students from eight liberal arts colleges in New England and the Mid-Atlantic states. 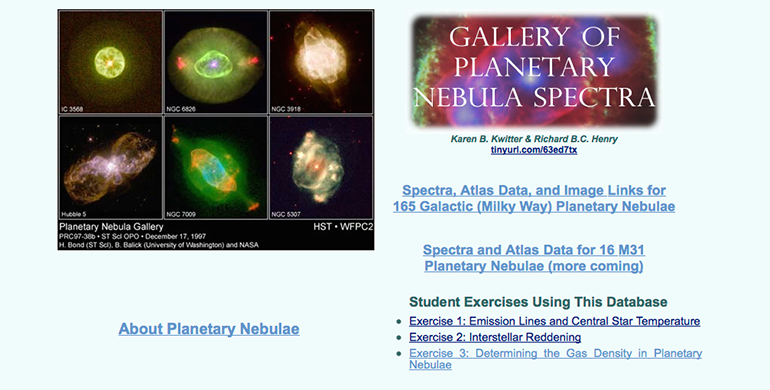 Among KNAC’s activities are a summer exchange program for astronomy research students and a fall student research symposium. 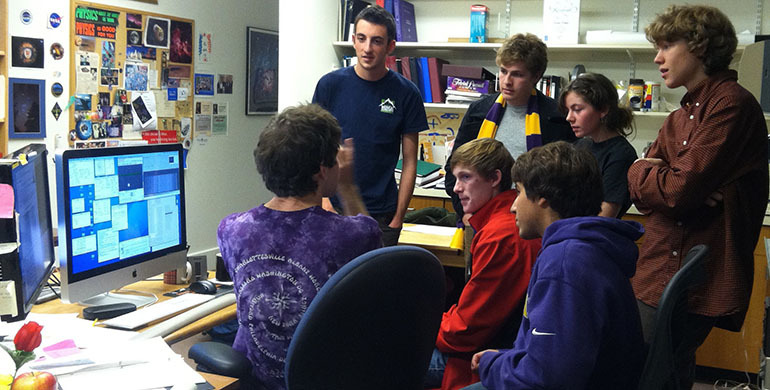 Williams College also participates in the educational aspects of the Zwicky Telescope Facility of Caltech’s Palomar Observatory, which links the 200″, 60″ and 48″ telescopes on Palomar Mountain for time-domain astronomy. After you have finished browsing our pages, you might want to explore some of these other astronomy sites. Hopkins Observatory planetarium shows are cancelled due to technical difficulties.